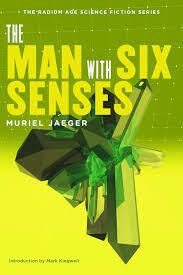 Muriel Jaeger (1892-1969) wrote several science fiction novels, starting with The Question Mark (1926), which follows Edward Bellamy in having someone wake up after many generations, and find himself in a Utopia: however, unlike Bellamy or the characters in Wells’s utopias, her people are far from perfect. The Man with Six Senses (1927) imagines a weakly youth with psychic powers; Hermes Speaks (1933) looks at the problems of believing in the prophecies of a fake medium; and Retreat From Armageddon (1936) is a future war novel which advocates genetic engineering. For more details, see The Encyclopedia of Science Fiction. Jaeger was born in Barnsley in Yorkshire, the daughter of John Edward Jagger, an accountant; it is not clear when (or why) the family changed the name from Jagger to Jaeger. She was educated at Sheffield, and won a scholarship to Somerville College, Oxford, in 1912. Her nickname in college was James, or Jim, or even Jimmy: her friend Dorothy L. Sayers would address her in al three ways. They were close friends: “Dearest Jim, This is just a line to tell you how much I love you” began a letter written by Sayers on 11 April 1916. At Oxford, Jaeger, Sayers and others (including Winifred Holtby) formed a writers’ group called, with irony intended, the Mutual Admiration Society. As for Jim Jaeger, she is a mystery. She is still here, with no job, living, I imagine, entirely on her people or somebody, and writing something mysterious, which she won’t say anything about to anybody. I suspect her of a novel, like everybody else. A novel seems to be the thing to write now-a-days. I wish I had the application for it. Unfortunately, novels seldom interest me, even to read, and the thought of grinding one out is fearful! (Letters, 178). Jaeger did take time off to encourage Sayers to write the first Lord Peter Wimsey book (Sayers read lots of detective stories, so these presumably do not count as the “novels” which she so seldom read.) Whose Body? (1923) was dedicated “To Jim”: “If it had not been for your brutal insistence, Lord Peter would never have staggered through to the end of this enquiry.” Jaeger’s own first novel, The Question Mark, was published in 1926. She persevered with the others, but they never sold well, and adverse criticism upset her. She wrote plays, and she wrote a lot of non-fiction: popular history, biography and so on. She never married; she died at home, in Tunbridge Wells, in 1969. I am relying on Elizabeth J. Morse’s entry in the Oxford Dictionary of National Biography, and quoting from Barbara Reynolds, ed., The Letters of Dorothy L. Sayers, 1899-1936: the Making of a Detective Novelist (London: Hodder and Stoughton, 1995; quoted from Sceptre Paperback, 1996).